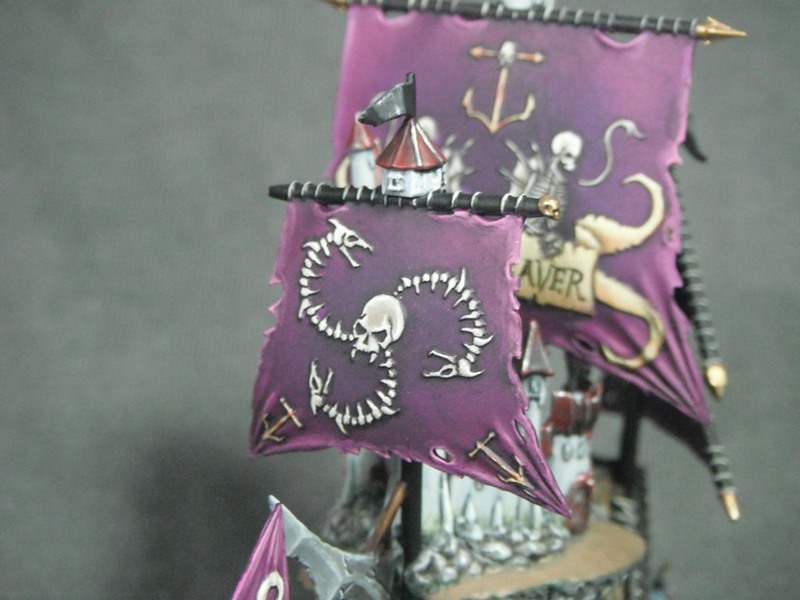 I have finally finished the first of my Dreadfleet ships, The Bloody Reaver. Well, I say ship, it’s actually a magical floating castle torn free from a mountaintop in Sylvania and translocated to the Galleon’s Graveyard. The background to this ship puts me very much in mind of Duckula and the way in which the castle teleports around only to return to Transylvania at the most inopportune moments. If you have no idea what I’m talking about then you are probably either too young or not British. Either way I would certainly encourage you to check out this brilliant cartoon. Initially I wasn’t too fond of The Bloody Reaver from the photos in White Dwarf but in reality the model looks a lot better than in the pictures. It is incredibly finely detailed and quite cleverly designed. The main body of the ship is an island with numerous shipwrecks clustered around it (kind of like a fantasy version of a space hulk). However, the designers have retained the profile of a ship which gives it quite a witty and playful aesthetic. It took me much longer than anticipated to paint the ship. This is partly due to all of the tiny details and also because of the way in which the model needed to be painted in several sub-assemblies and then put together afterwards. This was a bit fiddly and I would recommend that anyone who is starting to put this kit together takes a moment to put some thought into how everything goes together first before breaking out the glue and paints. The main problem here is with gap-filling. I attached the two halves of the island together first, filling any gaps. 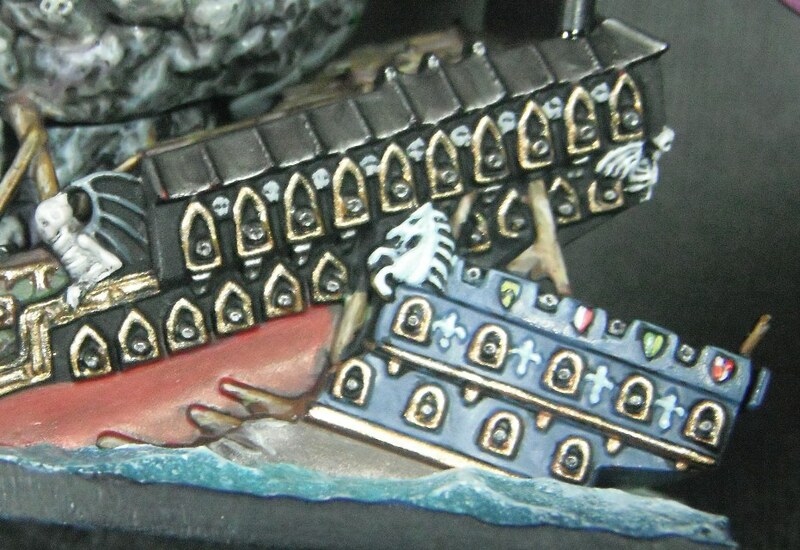 After this I then painted those, keeping the shipwreck/castle pieces and sails separate. 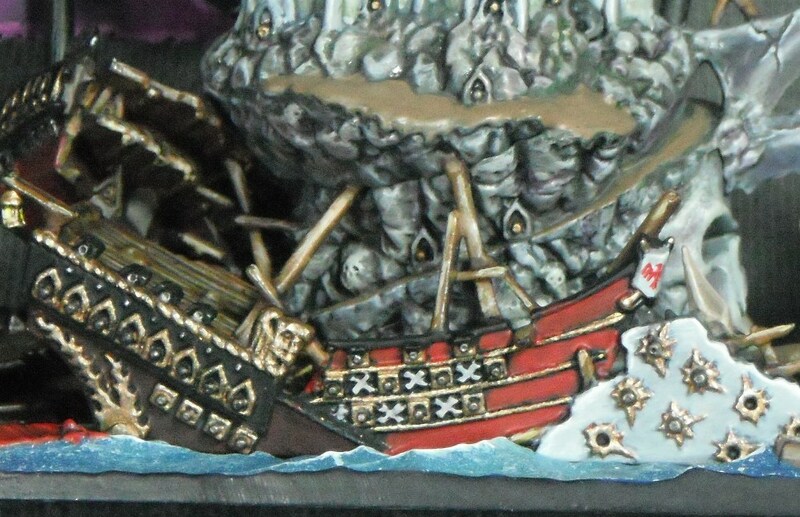 This is so that you can paint all of the detail and also because the shipwreck/castle parts lock the sails in place and so need to be attached last. After gluing everything in place there were gaps in the courtyard of the castle and on the pathway which needed to be filled after final assembly which was tricky as most of the model had been painted at this stage and I am not used to filling gaps after painting a model. I used GW’s new ‘liquid greenstuff’ for this and I must say I’m impressed. It is water soluble and can be painted straight on with a brush giving you a great deal of control. I found two or three thin coats were enough to fill in any fine gaps (anything larger and you would need to use a more conventional putty). Once the gaps were filled I simply painted over them with Graveyard Earth. On reflection, if I were to build this ship again I would remove the ball joints from the bottom of the masts and fit the masts right at the end. 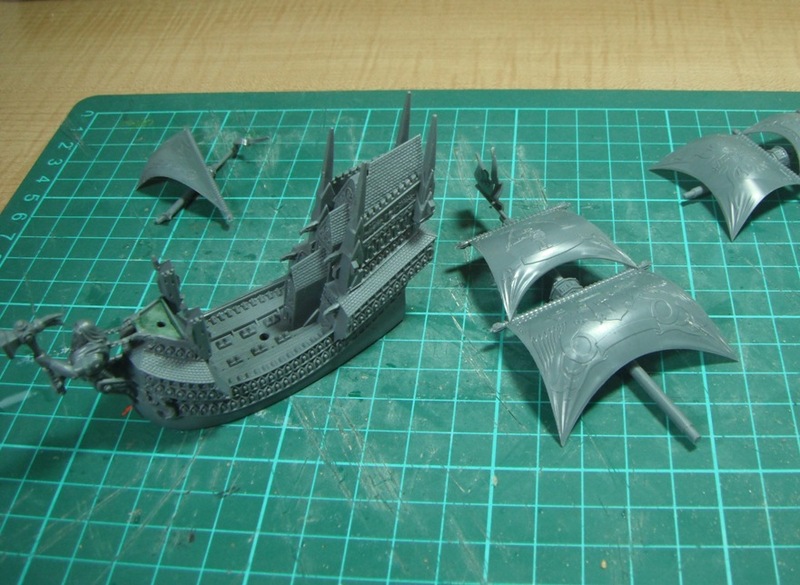 The rest of the Dreadfleet ships fit together in this way so I’m not sure why The Bloody Reaver doesn’t. 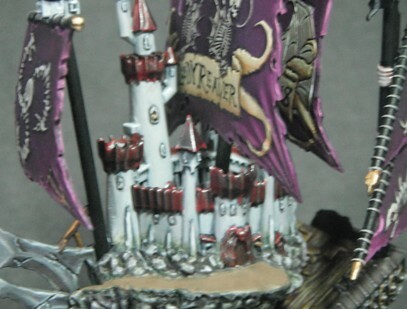 Also, you might be able to tell from the picture above that one of the turrets connects rather awkwardly with the sail, making it difficult to position the sail straight. If I were to make another Reaver I would probably remove the offending turret. I’m very pleased with how the sails turned out. The relief designs are a joy to paint and add a lot of visual interest to the models, further defining the look and feel of each ship. Rather irritatingly, the sails obscure each other. 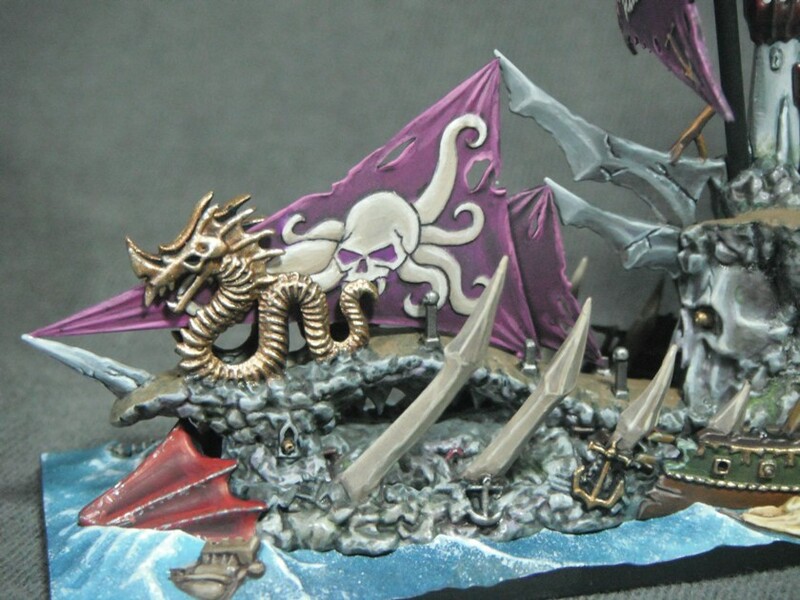 In particular the rearmost sail can hardly be seen at all on the finished model which is a shame as it has a fantastic (or should that be ‘fang-tastic’) design on it. 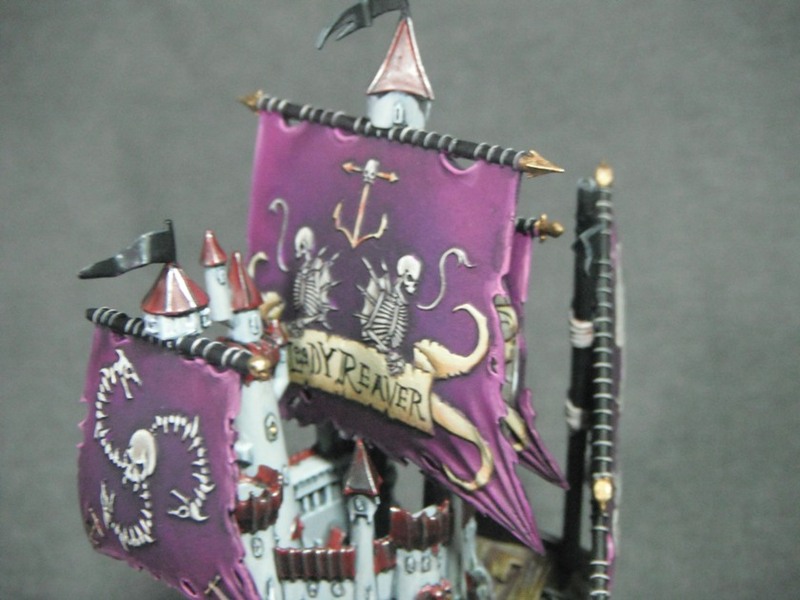 I also think that the freehand turned out better on this sail than on the one that reads ‘Bloody Reaver’. I thought I would photograph it as it will hardly be visible on the model. Never mind, at least I’ll know it’s there. Here are some close ups of all of the amazing details that adorn the ship. 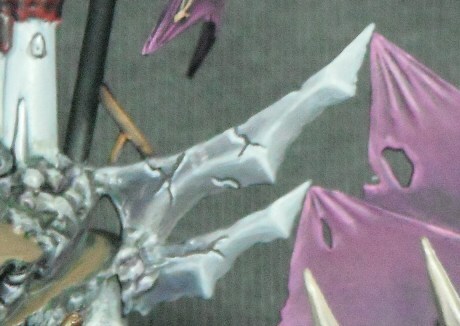 I decided to paint the statues/figure heads of the Reaver gold rather than the bone colour seen on the ‘Eavy Metal version as I thought that the bone was too similar in colour to the sail’s design. With the shipwrecks I tried to keep them in fairly neutral colours in order to prevent them from being too overpowering. The red hulls are an exception to this but they work as they tie in with the red used elsewhere on the ship. 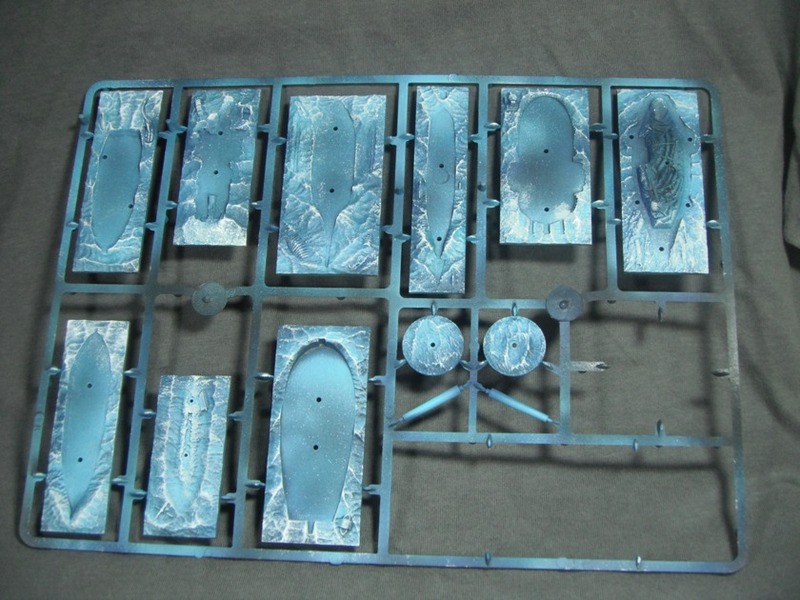 For the blue wreck I used Fenris Grey and highlighted this by adding Codex Grey in order to keep the colours muted. I also painted some simple shield designs on the tiny shields but they don’t show up too well in the photo. I also added some freehand cracks to the stone blade that juts out over the cave. This is a technique that I’ve wanted to try for a while. I painted thin lines of chaos black and highlighted them using Fortress Grey and Skull White. This is quite a simple yet effective way of adding three-dimensional looking damage (trompe l‘oeil as the French would say). I think some of my lines are a little thick but I would use the technique again for paint chips on armour or vehicles. I painted all of my bases using an airbrush while they were still on the frame. They were first airbushed with Regal Blue followed by Hawk Turquoise and then Hawk Turquoise with increasing amounts of Skull White added. I tried to spray at an angle so that the spray caught the upper parts of the waves providing an illusion of depth. 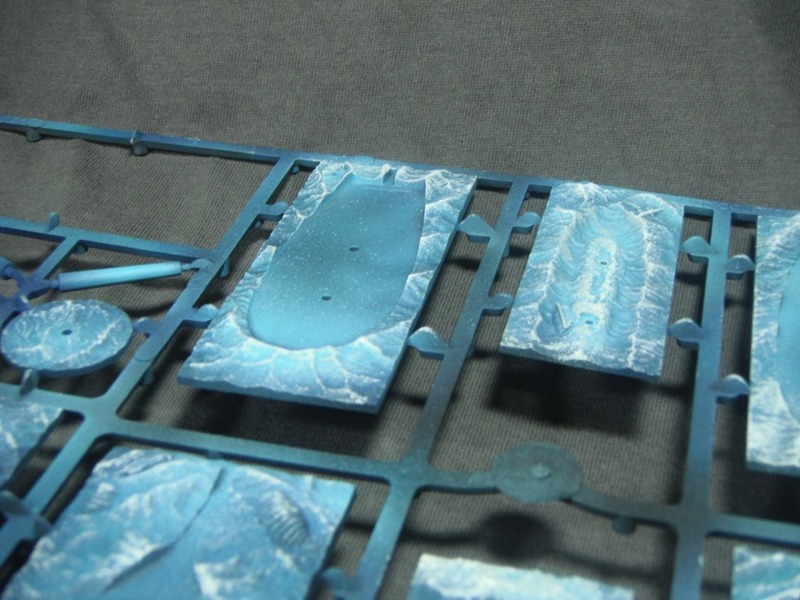 I then randomly sprayed on some Thrakka Green and Asurmen Blue in order to create further variation. The crests of the waves were stippled with Astronomican Grey followed by Skull white using a blister pack sponge. This gives a very natural, random appearance to the placement of the spray on the waves. 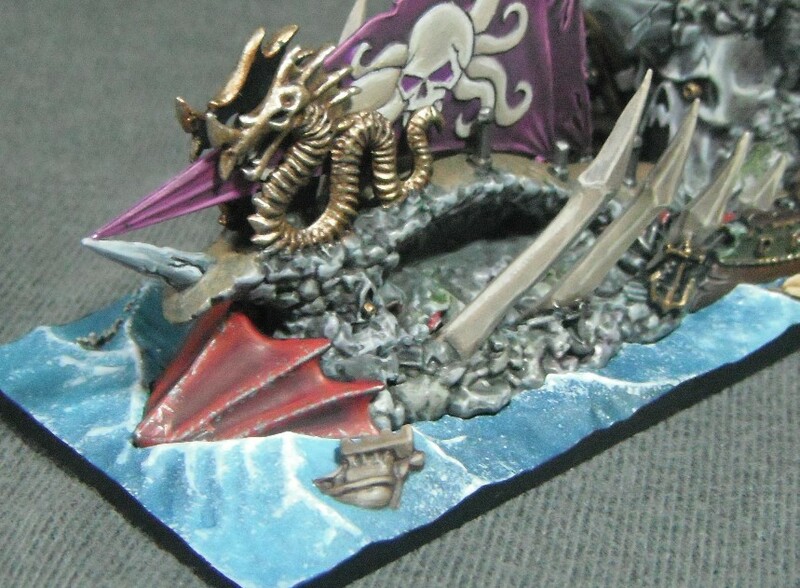 I focused in particular on any areas where the water would be more disturbed such as the ship’s wake or the frothing sea on the Shadewraith’s base. When I come to do each ship the bases will be clipped off and futher refined with a brush. 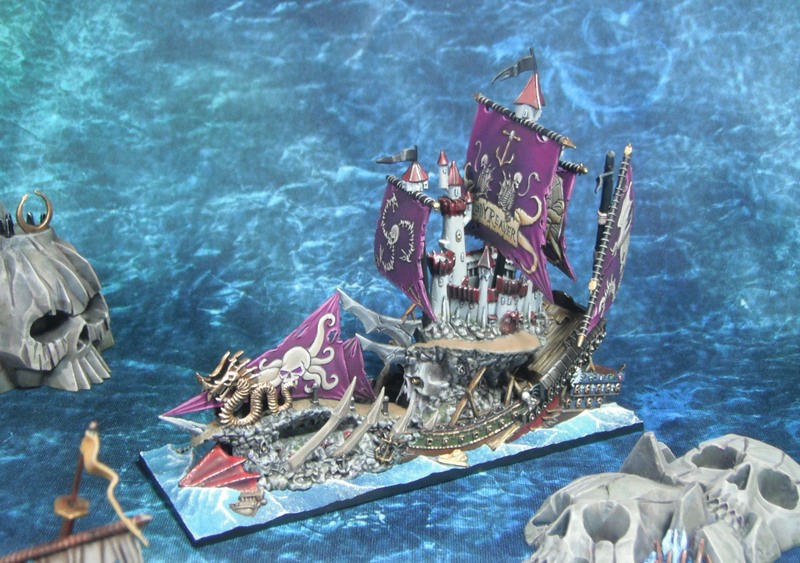 The next ship to hit the painting table will be the flagship of the Grand Alliance, The Heldenhammer. This is because the first scenario requires The Heldenhammer and The Bloody Reaver so I wanted to get them painted first. 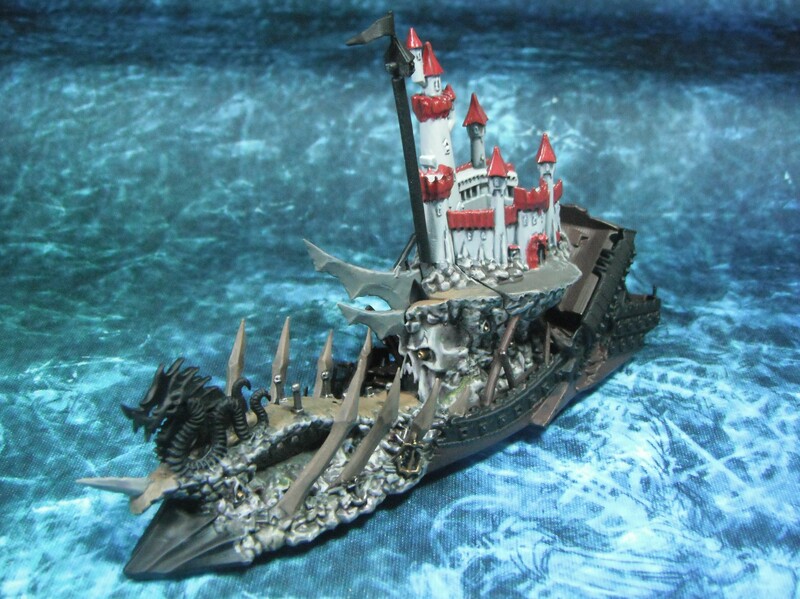 I also plan on painting the cog auxiliaries for these ships along with the sea monsters as these will be required for the first scenario too. 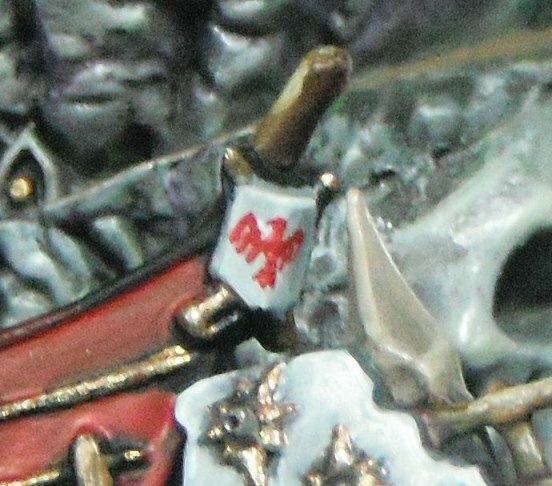 Hopefully The Heldenhammer won’t take as long as the Reaver as it is a less complicated ship being largely one colour. Goodnight out there…whatever you are! Just a quick update on The Bloody Reaver. This is probably the most purple I have ever painted on a model by quite a long way. I rather enjoyed it though and so may paint up more models in this colour in the future (my mind is already racing with ideas of Slanneshi Chaos Space Marines). 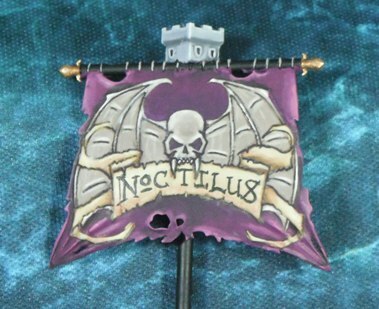 When it came to painting the sails I chose a darker, more bluish purple than the GW colour scheme. 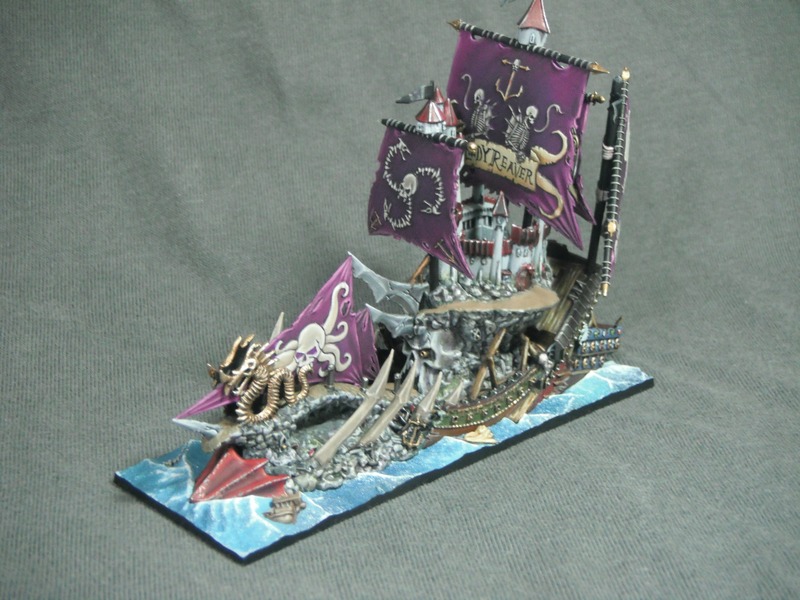 To achieve this, the sails were airbushed Liche Purple followed by an airbrushed highlight of two-parts Liche Purple, one-part Warlock Purple and one-part Bleached Bone around the edge of the sails. Using a brush I added some finer highlights by adding more Bleached Bone to the previous mix. 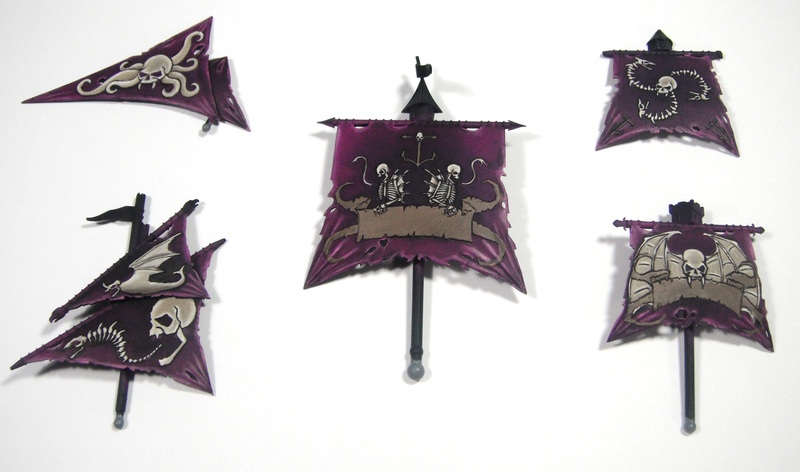 In order to achieve a dark, rich look to the purple the sails were then washed with a thinned mix of Liche Purple, Warlock Purple and Chaos Black (roughly a 2/2/1 mix). After this had dried completely I picked out the skeletal designs with Khemri Brown and highlighted them by adding increasing amounts of Bleached Bone followed by Skull White, working through several thin layers to ensure a smooth finish. All that remains is to paint the anchors and scroll work and the sails will be done.